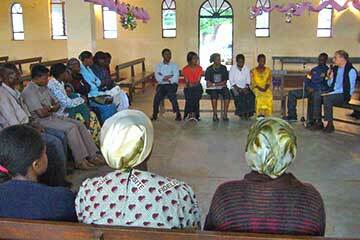 During the month of February 2007, two brothers of the community, one of whom hails from the Democratic Republic of Congo, made a series of visits in East Africa. Here we are in Lubumbashi, the “capital of copper”, situated more than 2000 kilometres from Kinshasa, the political capital of the country. At the airport, we did not expect such a welcome! It was beyond anything I imagined. Young and not so young had come all the way to welcome us. Some of them even brought flowers! What a joy to be welcomed by friends we know us, but also by so many young people, most of whom do not even know our community. There was even the local TV which followed our visit by broadcasting each day part of our meetings and visits. We met people who told us about their first contact with Taizé in the 1970s. 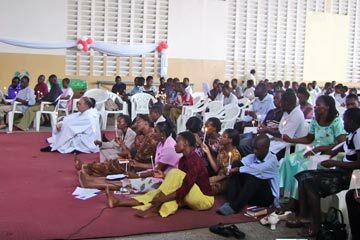 It was from these meetings that the local “youth ministry” was born, and which now forms the nucleus of youth training here. Some of the young people accompanied us all the time, for the visits and to meet the religious leaders, as for example at the seminary at Kafutu. 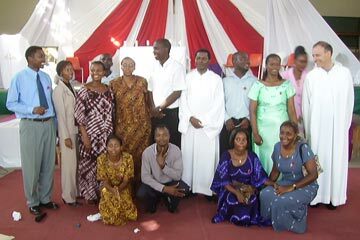 At Kafutu, we met the bishop, and later there was a very friendly meeting with the future priests. In Lubumbashi, the visit to a reception centre for “girls at risk” (in other words, street girls) run by Ursuline sisters was a deeply moving experience; especially seeing these very young girls, some of whom were perhaps 7 years old, beaming with joy and with gratitude towards the sisters. What harmony! I think they have found in the sisters what they missed in life: the presence of their parents. What suffering these girls have been through! We listened as one of the sisters told us about the difficulties the girls had undergone, including violence of all kinds. On Friday, the young people had organized a small meeting at the Lutheran Church, followed by prayer around the cross. There were about thirty people present. The pastor was touched to see the young people of various denominations praying together around the cross. On Saturday there was a day of reflection centred on the call of Peter after the miraculous catch of fish, in the Gospel of Luc (5, 1-11). The short bible introduction was followed by a time of exchange on the responsibility that the Lord’s call to Peter implies. “Put out into the deep water and let down your nets for a catch.” This exchange was very important for the country as it writes a new page of its history following the holding of free and democratic elections. Many challenges have to be taken up in order to help people overcome the misery of which they are victims. 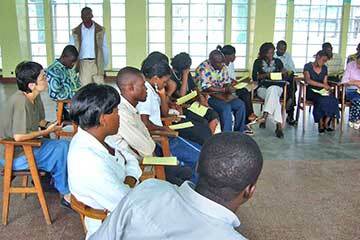 This meeting was of primary importance so that the young people could express themselves. As you go back and forth through the city of Lubumbashi and you see the wealth with which the subsoil abounds (copper), while the population lives in poverty without precedent, it is quite simply nauseating. So many the young people are obliged to work under conditions that are sometimes inhuman, in order to earn a little money. Some work in the uranium mines without any protection whatsoever, and are thus exposed to radiation. We have been so warmly welcomed in Tanzania. Young people came to the airport with their parish priest. On Thursday evening, we took part in the regular prayer of the medical students. We were introduced to the young people and we were able to explain to them why we were here. The next day, we had a preparation meeting for our day of reflection and prayer. The day began with a Eucharist celebrated by the auxiliary bishop. He visited Taizé once, accompanied by his parents. Then came the Bible introduction on Luke 5, 1-11. In the small groups the sharing was of a very high quality. I think the young people were very touched by the call to go towards others, and by the questions; among them: giving our lives for others. And it was wonderful to meet young people we had already met in Taizé. Some of them have now finished their studies and work as doctors, nurses… It was an enormous job for them to prepare this visit, especially for those who were preparing for exams at the same time! You have to admire those who, although they were visibly tired, used their remaining energy to ensure that the meeting went off well. We were deeply grateful for the welcome of the cardinal, and of the Franciscan sisters, one of whom is from Rwanda. She told us about the situation in her country. Obviously, the same question came up everywhere: what is the situation like in the Congo? This was a chance for me to reassure them about what is happening there. Thursday 22: We have just arrived in Kampala after travelling more or less 13 hours by bus. We were well received by the young people who stayed with us until very late. “Afterwards, we set off for the West, to Mbarara, to the country of the Linyancoles, with a group of people in ministry… with a day in a small community for young people finding their way back into society; they take part in information programs on AIDS for high school students, through music and seminars: “Behaviour Change Program” and “Life in the Spirit”. We spent a day in a charismatic community. This is an important reality in this country. This particular community has existed for eight years, and they have much creativity and generosity. Next, we visited a community of Poor Clares where we took advantage of the silence! In Kampala, we continued to make links with people in charge of youth ministry. The Catholic chaplain will be in Taizé for Holy Week.